I love sitting out on my back porch...the scent of jasmine slowly permeates the air and creeps into my memories of the summer. This soap has a true strong Jasmine scent. It has goatmilk which makes the lather extra creamy; while the silk fibers add a silkiness to the lather. 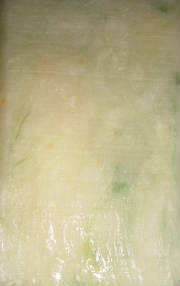 The yellow and green oxides are marbled throughout the bar. Take me to the Soap Page, please!